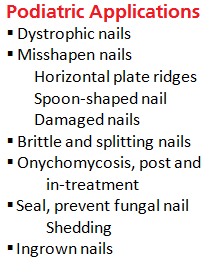 Patients come in with dystrophic or damaged toenails, leave with attractive toenails they can display! Now, for the first time, you can immediately change you patients’ unsightly nails to become more aesthetically pleasing in minutes when you add Just For Toenails Prosthetic Nail System to your podiatry practice! Now, a patient can come to you for treatment and leave happy with a beautiful toe or toes. With Just For Toenails Prosthetic Nail System, gel nails are constructed by the podiatrist or Medical Nail Technician and the speedy result is the change of a damaged nail into a beautiful one. The patient leaves your office with a smile on his or her face, and rushes to purchase new open toe shoes! And you have full payment at your front desk! Why Prosthetic Toenails in a Podiatry Practice? Offers immediate improvement in appearance — People who have misshapen nails feel they cannot wear sandals or go barefoot without drawing attention to their ugly toenails. Now, with Just For Toenails Prosthetic Nail System, no one will know what they really look like! Except their podiatrist! Attracts new patients to the practice – With proper marketing, new people will hear of the new service and call for an appointment. Soon, they consider you “their podiatrist” and when/if they have a problem, your office is the one they call. Increases visits by many patients – These patients come to your office once a month for evaluation, possible removal, and reapplication of the product. Provides cash service benefits to the practice – The Just For Toenails Prosthetic Nail System provides something unknown to podiatrists, immediate and full payment! In the cash drawer before the patient leaves! No waiting for the money! Increases profits – Just For Toenails Prostehtic Nail System can add profits to your practice. And can be offered by a practice extender who can perform other non-insurance, cosmetic treatments! (See www.medinail.com. The dermatologists, plastic surgeons and aesthetic medicine physicians have been doing this for a many years. Now it’s our turn! The Best Benefits? No waiting for the money, getting all that we charge for the service, the patients are happy with the immediate results when they leave… and you have a patient returning monthly! Just For Toenails Prosthetic Nail System prosthetic toenails are a new service a podiatry office can offer, a non-insurance service that brings new cash flow into the practice. Marketed well, Just For Toenails Prosthetic Nails can also bring new patients into the practice. The podiatrist has the choice of applying the toenails or hiring a medically trained nail technician. (See www.medinails.com) No matter who performs the service, however, the podiatrist will see new and unincumbered cash coming into the practice. Interested in learning how to add prosthetic nail to your practice? Contact us for more information.